Storm Chasing Adventure Tours is all about consistency. Nobody finds more tornadoes and severe storms than we do. We are conistently the first on the scene as storms form. We can back-up our statements: View our photos and videos to see why we are the world's most respected storm chasing tour company. There are only a few good chasing groups out there that know what they are doing. The others simply don't have the experience to get their guests close enough or in the right position to experience tornadoes and severe thunderstorms. Why are we so much better than the rest? 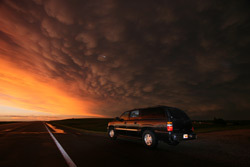 About 60% of storm chasing relies on visual clues from the sky. It takes years to learn how to read the sky, a skill that can vastly increase your chances of seeing severe weather. The other 40% of storm chasing is knowing how to read weather data and knowing if the visual clues match that data or not. Too many chasers go where the computer forecast models tell them to. The truth is that these forecast models are not accurate enough to predict exactly where severe weather will occur and can only give an estimated location. If you rely heavily on forecast models and don't use visual clues, you are going to miss a great deal of storms and tornadoes. Each morning, we analyze the upper air and surface data, forecast models, satellite imagery, and other types of weather data. With all this information, we will forecast the best severe weather target area for the day. We will depart our hotel between 9:00am and 11:00am after discussing the forecast and target area with our tour guests. We will refine the target area as the day goes on with any new information we obtain from our mobile Internet system and continual radar updates as we drive to the target area. Due to prime storm chasing time being in the late afternoon and early evening hours, we try to find a locally popular restaurant for lunch, which may become our main meal of the day. By 4 to 6 p.m. we want to be in the vicinity of the severe weather target area on chase days, so late afternoon rest stops tend to be fast food or snack opportunities. Since we may be in very rural areas for the afternoon and evening storm chases, stopping for dinner might not be possible. Please note that we will not stop for dinner once the active chase begins to avoid missing potential severe weather. We arrive at our hotel near dark. We never chase after dark because it's just too dangerous. When there are no storms or on non-chase days, we should arrive at our hotel around 5 to 7 p.m.
During your trip, you'll be part of an important service that relays timely information back to the National Weather Service to help prevent loss of life, injury and property damage in local areas affected by severe storms. Most tours experience supercell thunderstorms and lightning shows at night, but not every tour will see these phenomena. It's also important to note that in some seasons only some tours will experience these things. 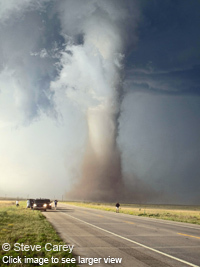 When conditions warrant, tornadoes form. 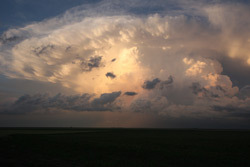 We cannot guarantee that you will see a tornado, but we can say that you will have a great experience seeing great storm structure and the beautiful scenery of the Plains. 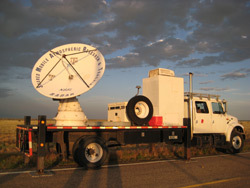 On some tours, you'll be able to see university and government storm chasers with Doppler on Wheels (DOW) equipment and other reasearch tools. 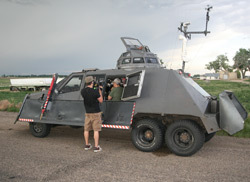 From time to time you may see the Tornado Intercept Vehicle (TIV) from the show pass by on your tour. This vehicle is equiped with an IMAX camera and is able to withstand a direct hit from a weak tornado. It's a real thrill to see a television show in production right there in Tornado Alley, so be sure to look for the TIV while you're out there. We will travel as far as necessary to areas that have the best chance for tornadoes with few trees for good viewing. This area covers Texas west of the Dallas-Ft. Worth area, Oklahoma west of Oklahoma City, Kansas in areas west of Wichita on northward where there are few trees, far eastern New Mexico, Kansas, Eastern Colorado, Nebraska, South Dakota, and Southeastern Wyoming. We do not chase where there are numerous trees because they severely limit the visibility of storms and tornadoes. Copyright © 2018 Storm Chasing Adventure Tours.